I've had my own little personal literary renaissance during the past few months. I read voraciously when I was growing up, but as I entered high school and my life got busier, my appetite for books waned. I'm ashamed to say that I haven't read much of substance (other than the occasional technical book or Harry Potter volume, if that counts) for a long time. Thankfully, that's changed recently. When I was studying in London earlier this year, I took a British literature class, which forced me to read lots in little time--and I liked it! All of that reading reminded me that I had been missing out on an enriching part of life, and I decided continue when the class ended. In what I hope will be the beginning (renewal?) of a lifelong habit, I'm planning to read a book a month for the next year. In a nod to keeping myself accountable (to myself, mostly), I'm going to write about my reading here. I'm planning to select from a wide menu of books, from classics to popular fiction to history. If you have suggestions, let me know. 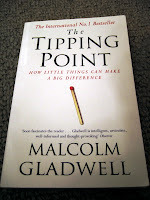 I started reading The Tipping Point, by Malcolm Gladwell, on a road trip last summer, but my reading ended 1/3 of the way through the book when we got to our campground. So when I saw the book in the airport as I was leaving London a few weeks ago, I bought a copy. I finally finished it tonight. Gladwell's premise is that social phenomena spread nonlinearly. In other words, some ideas and trends don't spread through society at a predictable, steady pace; instead, they stay below the radar for a little while, and then they suddenly explode. Gladwell notes several examples, such as NYC's sudden decrease in crime in the 90's, the surprising resurgence of Hush Puppies a decade ago, or the runaway popularity of the children's TV show Blue's Clues. The Tipping Point presents several phenomena that have "tipped", and then explores the reasons for their success. His examples come from diverse areas, including government, business, culture, and public health. Gladwell's main point is that little things can have a huge impact: spreading a marketing message to a few key people can be more effective than a huge advertising campaign; slight changes to the content of a TV program can produce huge increases in interest; cleaning graffiti in New York can lead to a sudden fall in crime rates. While I don't buy all of his arguments (like the ones about NYC crime), reading Gladwell's book made me reevaluate some of my ideas about how the world works. His examples are interesting, which makes the book both enjoyable and informative.